El Blog de Medicina Cubana: Cuban officials and doctors misinform about causes of death and transmissions diseases. Cuban officials and doctors misinform about causes of death and transmissions diseases. Officials and Cuban doctors use abstract language to misinform. 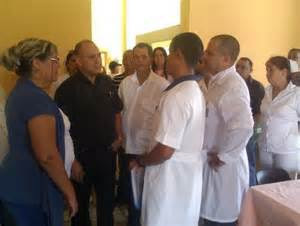 Officials of the sector's health in Cuba use an indefinite language referring to the causes of the deaths of patients in hospitals and epidemics spreading in several regions of the country. The purpose is to misinform the public. For cholera employ the expression "disease of digestive transmission" and when referring to a town where there are cases with dengue, allege that "it has waged a campaign against outbreaks of the mosquito Aedes Aegypti", or that "there are people on suspicion" of contracting the ailment. Another of the euphemisms used is "influenza vaccination campaign", of the efforts to combat the Influenza A virus. This causes highly infectious and dangerous diseases such as bird flu, and the swine flu. Misinformation or inaccurate communication on diseases and epidemics that affect citizens Matanzas, contributes to these manifest apathy when you call support medical campaigns, is trust, and do not protect against phenomena that they represent common and not risky. A year ago died in hospital Faustino Pérez, of the city of Matanzas, Mr. Marcelo Marcial Rivero Alonso, who resided in Cidra, community of the municipality of Union de Reyes. Days before his death, he suffered severe diarrhea, vomiting, fever, thirst, strong cramps in the stomach and decay. These are the symptoms of cholera. However, was diagnosed as a cause of death "septic shock". "Respiratory Distress (suffering)" was the diagnosis of the doctors at the military Hospital for the death, on 6 September last, Pedro Francisco Rodríguez Díaz, 57-year-old national, who also resided in the town of Cidra. This had entered on day 3, with the symptoms of the influenza A H1N1: increased nasal discharge, high fever, cough, sore throat, vomiting and decay. It has become common to that to outbreaks of Dengue and Influenza A H1N1 as will affect dozens of citizens in Matanzas territory. An official of the Provincial Center of hygiene and epidemiology speaks of "suspected cases", not sick, referring to mourners. In this way they try to preserve the false image created on the Cuban health system. It's no secret to the bureaucrats in the health sector the elementary right of citizens to receive detailed, accurate and timely information. In the province of Matanzas, a few days ago referred to the municipalities "major problems" in the fight against outbreaks of the mosquito that transmits Dengue (Cardenas, Matanzas, Colon and Jagüey Grande). It is disturbing that they have not mentioned the rest of the affected municipalities. But cited ambivalent language is not exclusive of officials of State medical institutions. In the national housing body are called "extractions" unfair evictions of people from their homes, planned and led by the ruling party. The executives in the sector of health and medical staff must report accurately all that put in danger the life of citizens; they have an obligation to abandon his abstract language, because it misinforms and, far from resolving problems, complicates them. It is time for the people to respect and speak frankly. *José Óscar Sánchez Madan, is a Cuban journalist and author in several Cuban newspapers, and a regular contributor of the Miami-based independent news agency CUBANET. Publicado por EG en 9/18/2015 12:58:00 p. m.